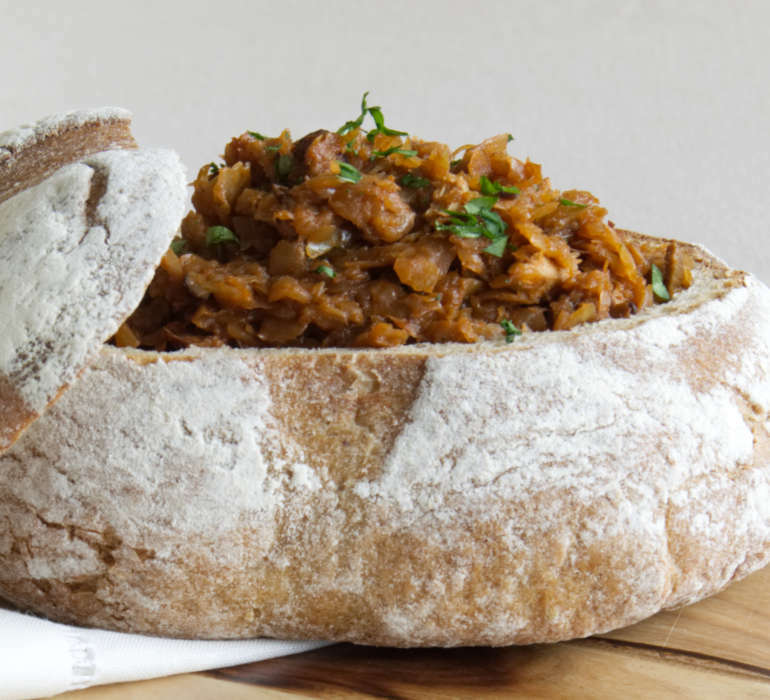 Bigos is one of the most known Polish dishes. It is a stew made with cabbage and meat. My mother always prepared it with white cabbage and sauerkraut, this way the stew has a better sweet-sour balance. You can put any meat in Bigos, for this recipe we use beef, chicken and bacon but my mother always puts a different kind of sausages. The dish was popular already in the 17th century. Every noble took Bigos with him when visiting a neighbour, going to hunt or sleigh ride. There are many different variations of Bigos: it can be prepared with apples, plums, peppers, white beans or sour cream. This recipe’s how we made it at home, so of course, it’s my favourite one! Bigos, like every stew, gets better when its heated several times. You can keep it in the fridge for four days or freeze it! Soak the mushrooms in 500ml of water overnight or at least 3 hours before you start cooking. Wash, dry and cut sauerkraut into smaller pieces. Set aside. Cut the onion into large cubes. Set aside. Cut the beef, bacon and the chicken into smaller pieces. Set aside. Cut the mushrooms into smaller pieces. Keep the water! In the separate pan melt butter and fry on the medium heat the onions until tender. Set aside. In the same frying pan add remaining butter and oil and fry in the medium heat beef until it turns brown. Take large pot and add to it: sauerkraut, shreded cabbage, meat, onion, mushrooms and spieces. Pour 500ml water, mushroom water and wine to it. Simmer for at least 3 hours. Every 20-30 minutes stir the stew. After 3 hours take the pan and fry chicken breast on 1 tbsp of oil over low heat unstil tender (probably not longer then 4 minutes). Add the chicken and tomato pure to the stew and simmer for another 15 minutes. Season with salt and pepper. Add sugar if the stew turns more sour then you like! Serve the stew warm with white bread. The stew tastes better the day after cooking. 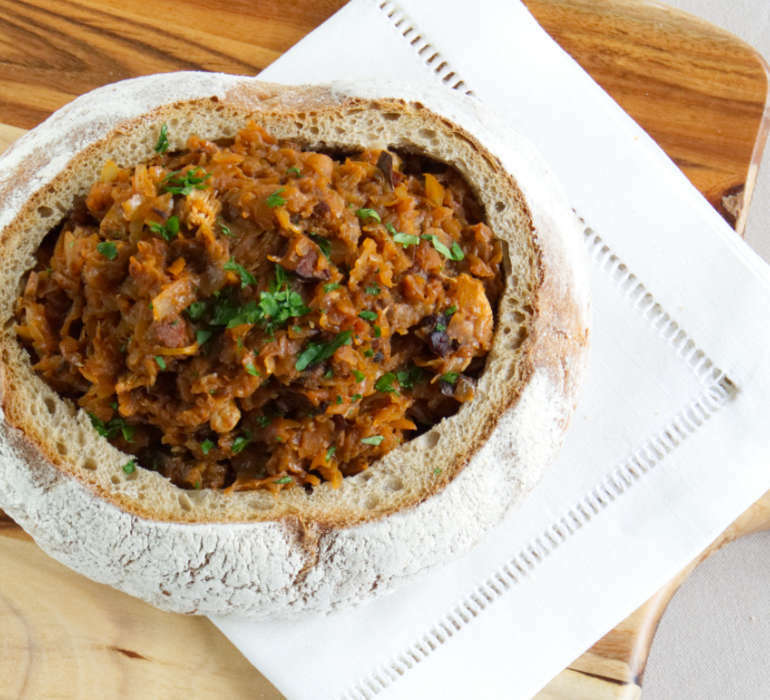 To make the recipe even easier here is a short video that shows you how to prepare Bigos in one pot! If you are interested in other Polish recipes please go to Poland recipes subpage.